Rural Skills Training's standard introductory two-day training course provides the practical skills and confidence necessary to construct strainer assemblies capable of holding line wire, barbed wire and stock net under considerable tension. This is an experiential course where participants carry out each stage of fence building using the necessary tools and materials to safely create a long lasting stock proof barrier. This course also covers considerations and techniques for dealing with rough ground and difficult terrain, and touches on deer fencing, gate hanging, and fence repair. 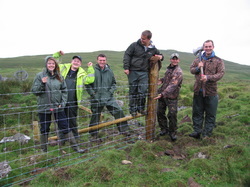 The course is designed for those wishing to tackle their own fences at home or those working on the land and wishing to undertake fencing in a work environment. The course can be adapted to focus more on gate hanging, or post and rail fencing so that you get what you want to learn. Have gained knowledge and experience of constructing wire fences. specification to suit the terrain and function of the fence. Be aware of the possibilities necessary to close off gaps, and cross burns.